Mumps is a viral disease caused by the mumps virus. Initial signs and symptoms often include fever, muscle pain, headache, poor appetite, and feeling generally unwell. This is then usually followed by painful swelling of one or both parotid salivary glands. Symptoms typically occur 16 to 18 days after exposure and resolve after 7 to 10 days. Symptoms are often more severe in adults than in children. About a third of people have mild or no symptoms. Complications may include meningitis (15%), pancreatitis (4%), inflammation of the heart, permanent deafness, and testicular inflammation, which uncommonly results in infertility. Women may develop ovarian swelling, but this does not increase the risk of infertility. Mumps is highly contagious and spreads rapidly among people living in close quarters. The virus is transmitted by respiratory droplets or direct contact with an infected person. Only humans get and spread the disease. People are infectious from about 7 days before the start of symptoms to about 8 days after. Once an infection has run its course, a person is typically immune for life. Reinfection is possible, but the ensuing infection tends to be mild. Diagnosis is usually suspected due to parotid swelling and can be confirmed by isolating the virus on a swab of the parotid duct. Testing for IgM antibodies in the blood is simple and may be useful; however, it can be falsely negative in those who have been immunized. Mumps is preventable by two doses of the mumps vaccine. Most of the developed world includes it in their immunization programs, often in combination with measles, rubella, and varicella vaccine. Countries that have low immunization rates may see an increase in cases among older age groups and thus worse outcomes. No specific treatment is known. Efforts involve controlling symptoms with pain medication such as paracetamol (acetaminophen). Intravenous immunoglobulin may be useful in certain complications. Hospitalization may be required if meningitis or pancreatitis develops. About one in 10,000 people who are infected die. Without immunization, about 0.1 to 1.0% of the population is affected per year. Widespread vaccination has resulted in a more than 90% decline in rates of disease. Mumps is more common in the developing world, where vaccination is less common. Outbreaks, however, may still occur in a vaccinated population. Before the introduction of a vaccine, mumps was a common childhood disease worldwide. Larger outbreaks of disease typically occurred every 2 to 5 years. Children between the ages of 5 and 9 were most commonly affected. Among immunized populations, those in their early 20s often are affected. Around the equator, it often occurs all year round, while in the more northerly and southerly regions of the world, it is more common in the winter and spring. Painful swelling of the parotid glands and testicles was described by Hippocrates in the fifth century BCE. Mumps is usually preceded by a set of prodromal symptoms, including low-grade fever, headache, and feeling generally unwell. This is followed by progressive swelling of one or both parotid glands. Parotid gland swelling usually lasts about a week. Other symptoms of mumps can include dry mouth, sore face and/or ears, and difficulty speaking. Painful testicular inflammation develops in 15–40% of men who have completed puberty and contract the mumps virus. This testicular inflammation is generally one-sided (both testicles are swollen in 15–30% of mumps orchitis cases) and typically occurs about 10 days after the parotid gland becomes inflamed. Testicular swelling has been documented as late as 6 weeks after parotid-gland swelling. Decreased fertility is an uncommon consequence of testicular inflammation from mumps and infertility is rare. Studies have reached differing conclusions regarding whether infection with the mumps virus during pregnancy leads to an increased rate of spontaneous abortion. Before vaccination, about 10 % of cases of aseptic meningitis were due to mumps. The symptoms generally resolve within 10 days. Infection of the brain itself (encephalitis) occurs in between 0.02 and 0.3% of cases. Ovarian inflammation occurs in about 5% percent of adolescent and adult females. Acute pancreatic inflammation occurs in about 4% percent of cases, manifesting as abdominal pain and vomiting. Brain inflammation is very rare, and fatal in about 1% of the cases when it occurs. Profound (91 dB or more) but rare sensorineural hearing loss can occur, which can be uni- or bilateral. Acute unilateral deafness occurs in about 0.005% of cases. The mumps virus is an enveloped, single-stranded, linear negative-sense RNA virus of the genus Rubulavirus and family Paramyxovirus. The genome consists of 15,384 bases encoding nine proteins. Proteins involved in viral replication are the nucleoprotein, phosphoprotein, and polymerase protein while the genomic RNA forms the ribonucleocapsid. Humans are the only natural host for the virus. Mumps is spread from person to person through contact with respiratory secretions, such as saliva from an infected person. When an infected person coughs or sneezes, the droplets aerosolize and can enter the eyes, nose, or mouth of another person. Mumps can also be spread by sharing eating utensils or cups. The virus can also survive on surfaces and then be spread after contact in a similar manner. A person infected with mumps is contagious from around 7 days before the onset of symptoms until about 8 days after symptoms start. The incubation period (time until symptoms begin) can be from 12–25 days, but is typically 16–18 days. About 20-40% of persons infected with the mumps virus do not show symptoms, so being infected and spreading the virus without knowing it is possible. During an outbreak, a diagnosis can be made by determining recent exposure and parotitis. However, when the disease incidence is low, other infectious causes of parotitis should be considered, such as HIV, coxsackievirus, and influenza. Some viruses such as enteroviruses may cause aseptic meningitis that is very clinically similar to mumps. A physical examination confirms the presence of the swollen glands. Usually, the disease is diagnosed on clinical grounds, and no confirmatory laboratory testing is needed. If uncertainty exists about the diagnosis, a test of saliva or blood may be carried out; a newer diagnostic confirmation, using real-time nested polymerase chain reaction technology, has also been developed. As with any inflammation of the salivary glands, the serum level of the enzyme amylase is often elevated. The most common preventive measure against mumps is a vaccination with a mumps vaccine, invented by American microbiologist Maurice Hilleman at Merck. The vaccine may be given separately or as part of the MMR vaccine or MMRV vaccine. The World Health Organization (WHO) recommends the use of mumps vaccines in all countries with well-functioning childhood vaccination programmes. In the United Kingdom, they are routinely given to children at age 13 months with a booster at 3–5 years (preschool). The American Academy of Pediatrics recommends the routine administration of MMR vaccine at ages 12–15 months and at 4–6 years. In some locations, the vaccine is given again between 4 and 6 years of age, or between 11 and 12 years of age if not previously given. The efficacy of the vaccine depends on its strain, but is usually around 80%. The Jeryl Lynn strain is most commonly used in developed countries, but has been shown to have reduced efficacy in epidemic situations. The Leningrad-Zagreb strain commonly used in developing countries appears to have superior efficacy in epidemic situations. The WHO, the American Academy of Pediatrics, the Advisory Committee on Immunization Practices of the Centers for Disease Control and Prevention, the American Academy of Family Physicians, the British Medical Association, and the Royal Pharmaceutical Society of Great Britain recommend routine vaccination of children against mumps. General mumps vaccination with MMR began in the United Kingdom in 1988. Before the introduction of the mumps vaccine, the mumps virus was the leading cause of viral meningoencephalitis in the United States. However, encephalitis occurs rarely (less than two per 100,000). In one of the largest studies in the literature, the most common symptoms of mumps meningoencephalitis were found to be fever (97%), vomiting (94%), and headache (88.8%). The mumps vaccine was introduced into the United States in December 1967: since its introduction, a steady decrease in the incidence of mumps has occurred, with 151,209 cases of mumps reported in 1968. From 2001 to 2008, the case average was only 265 per year, excluding an outbreak of less than 6000 cases in 2006 attributed largely to university contagion in young adults. The treatment of mumps is supportive. Symptoms may be relieved by the application of intermittent ice or heat to the affected neck/testicular area and by acetaminophen for pain relief. Warm saltwater gargles, soft foods, and extra fluids may also help relieve symptoms. Acetylsalicylic acid (aspirin) is not used to treat children due to the risk of Reye syndrome. No effective postexposure recommendation is made to prevent secondary transmission, nor is the postexposure use of vaccine or immunoglobulin effective. Mumps is considered most contagious in the 5 days after the onset of symptoms, and isolation is recommended during this period. In someone who has been admitted to the hospital, standard and droplet precautions are needed. People who work in healthcare cannot work for 5 days. In the United States, typically between a few hundred and few thousand cases occur in a year. Mumps was known to humans since antiquity. It was mentioned by Hippocrates in his Of the Epidemics written in 400 BC, wherein he described the painful swelling of the parotid glands and testicles. The disease was first described scientifically as late as 1790 by a British physician Robert Hamilton (1721-1793) in the Transactions of the Royal Society of Edinburgh. The disease was one of the most medically significant diseases among the armies involved in the fighting both World War I and World War II. A number of attempts to prove that mumps is contagious failed. Its contagiousness was finally proved in 1934 by Claude D. Johnson and Ernest William Goodpasture (1886–1960), who demonstrated that mumps was transmitted by a filterable virus. ^ a b c d e f g h i j k l m n o p q r s t u v w "Mumps virus vaccines" (PDF). Weekly Epidemiological Record. 82 (7): 49–60. 16 February 2007. PMID 17304707. Archived (PDF) from the original on 16 March 2015. ^ a b c d e f g h i j k Atkinson, William (May 2012). Mumps Epidemiology and Prevention of Vaccine-Preventable Diseases (12th ed.). Public Health Foundation. pp. Chapter 14. ISBN 978-0-9832631-3-5. Archived from the original on 6 July 2016. ^ a b c d e f g h i j k l Davis NF, McGuire BB, Mahon JA, Smyth AE, O'Malley KJ, Fitzpatrick JM (April 2010). "The increasing incidence of mumps orchitis: a comprehensive review". BJU International. 105 (8): 1060–5. doi:10.1111/j.1464-410X.2009.09148.x. PMID 20070300. ^ a b c d e f g h i j Hviid A, Rubin S, Mühlemann K (March 2008). "Mumps". The Lancet. 371 (9616): 932–44. doi:10.1016/S0140-6736(08)60419-5. PMID 18342688. ^ a b Junghanss, Thomas (2013). Manson's tropical diseases (23rd ed.). Oxford: Elsevier/Saunders. p. 261. ISBN 978-0-7020-5306-1. Archived from the original on 13 May 2016. ^ a b Gupta, RK; Best, J; MacMahon, E (14 May 2005). "Mumps and the UK epidemic 2005". BMJ (Clinical Research Ed.). 330 (7500): 1132–5. doi:10.1136/bmj.330.7500.1132. PMC 557899. PMID 15891229. ^ a b c d e Kutty PK, Kyaw MH, Dayan GH, Brady MT, Bocchini JA, Reef SE, Bellini WJ, Seward JF (15 June 2010). "Guidance for isolation precautions for mumps in the United States: a review of the scientific basis for policy change". Clinical Infectious Diseases. 50 (12): 1619–28. doi:10.1086/652770. PMID 20455692. ^ a b c d e Sen2008 SN (2008). "Mumps: a resurgent disease with protean manifestations". Med J Aust. 189 (8): 456–9. PMID 18928441. Archived from the original on 25 December 2014. ^ Kasper DL; Braunwald E; Fauci AS; Hauser SL; Longo DL; Jameson JL; Isselbacher KJ; Eds. (2011). "194. Mumps". Harrison's Principles of Internal Medicine (18th ed.). McGraw-Hill Professional. ISBN 978-0-07-174889-6. ^ a b c "Pinkbook | Mumps | Epidemiology of Vaccine Preventable Diseases | CDC". www.cdc.gov. Archived from the original on 22 April 2017. ^ a b Longo, Dan L.; Kasper, Dennis L.; Jameson, J. Larry; Fauci, Anthony S.; Hauser, Stephen L.; Loscalzo, Joseph, eds. (2012). Harrison's principles of internal medicine (18th ed.). New York: McGraw-Hill. ISBN 978-0-07-174889-6. ^ "Mumps | Transmission | CDC". www.cdc.gov. Archived from the original on 13 April 2016. Retrieved 18 April 2016. ^ Krause CH, Eastick K, Ogilvie MM (November 2006). "Real-time PCR for mumps diagnosis on clinical specimens--comparison with results of conventional methods of virus detection and nested PCR". J. Clin. Virol. 37 (3): 184–9. doi:10.1016/j.jcv.2006.07.009. PMID 16971175. ^ Skrha J, Stĕpán J, Sixtová E (October 1979). "Amylase isoenzymes in mumps". Eur. J. Pediatr. 132 (2): 99–105. doi:10.1007/BF00447376. PMID 499265. ^ Buynak EB; Weibel RE; Whitman JE Jr; Stokes J Jr; Hilleman MR (March 1969). "Combined live measles, mumps, and rubella virus vaccines". JAMA. 207 (12): 2259–62. doi:10.1001/jama.1969.03150250089009. PMID 5818433. ^ Schlegel M, Osterwalder JJ, Galeazzi RL, Vernazza PL (1999). "Comparative efficacy of three mumps vaccines during disease outbreak in eastern Switzerland: cohort study". BMJ. 319 (7206): 352. doi:10.1136/bmj.319.7206.352. PMC 32261. PMID 10435956. ^ "Summary". WHO: Mumps vaccine. Archived from the original on 15 April 2006. Retrieved 18 April 2006. ^ Peltola H, Kulkarni PS, Kapre SV, Paunio M, Jadhav SS, Dhere RM (August 2007). "Mumps outbreaks in Canada and the United States: time for new thinking on mumps vaccines". Clin. Infect. Dis. 45 (4): 459–66. doi:10.1086/520028. PMID 17638194. ^ Plotkin, Stanley A.; Orenstein, Walter; Offit, Paul A. (2012). Vaccines E-Book: Expert Consult - Online and Print. Elsevier Health Sciences. p. 444. ISBN 9781455737987. ^ Kanra G, Isik P, Kara A, Cengiz AB, Seçmeer G, Ceyhan M (2004). "Complementary findings in clinical and epidemiologic features of mumps and mumps meningoencephalitis in children without mumps vaccination". Pediatr Int. 46 (6): 663–8. doi:10.1111/j.1442-200x.2004.01968.x. PMID 15660864. ^ McNabb SJ, Jajosky RA, Hall-Baker PA, Adams DA, Sharp P, Worshams C, Anderson WJ, Javier AJ, Jones GJ, Nitschke DA, Rey A, Wodajo MS (March 2008). "Summary of notifiable diseases--United States, 2006". MMWR Morb. Mortal. Wkly. Rep. 55 (53): 1–92. PMID 18354375. Archived from the original on 17 November 2009. Retrieved 13 November 2009. ^ "Mumps – National Library of Medicine – Pubmed Health". Archived from the original on 17 October 2014. Retrieved 14 January 2015. ^ "Mumps Clinical Information – Minnesota Dept. of Health". Archived from the original on 19 May 2011. 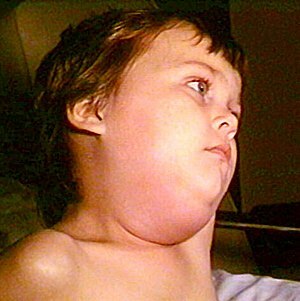 ^ "Mumps | Cases and Outbreaks | CDC". www.cdc.gov. Archived from the original on 1 May 2017. Retrieved 21 April 2017. ^ a b c d Samal, Siba K. (2011). The Biology of Paramyxoviruses. Horizon Scientific Press. p. 5. ISBN 978-1-904455-85-1. Retrieved 18 March 2019. ^ "Mumps". World of Microbiology and Immunology, in Encyclopedia.com. 1 March 2019. Retrieved 18 March 2019.